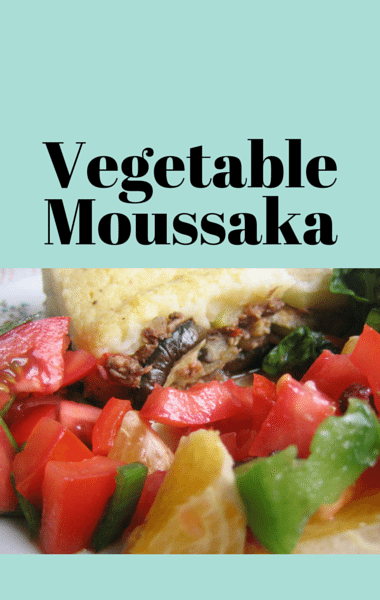 Michael Symon whipped up a delicious Vegetable Moussaka recipe on The Chew, the perfect vegetarian dish for Meatless Monday that your whole family will love! Check out my attempt to reproduce this recipe below. And be sure to let us know what you think of the recipe in the comments! Salt the eggplants slices and place them in a single layer on a parchment paper-lined baking sheet. Let them sit for a few hours so the moisture is drawn out. Dab them with a paper towel to wipe away the moisture and drizzle them with olive oil. Sprinkle them with oregano and black pepper. Put the eggplant slices in the oven for 15 minutes, then flip and put them back in for 10 more minutes. Add the potatoes to a large pot of water and bring to a boil. Cook until fork tender. Meanwhile, make the bechamel sauce. Melt the butter in a sauce pan over low heat and then add the flour. Stir until it has a wet sand consistency. Let it cook for about 30 seconds and then add the milk a little at a time, stirring constantly. Add the nutmeg and let it cook at a simmer on low heat for 30 minutes to cook out the flour taste. Finally, stir in the lemon zest, Parmesan cheese, and the egg yolks. To make the Ragout, add a drizzle of olive oil to a large Dutch oven and bring to medium high heat. Add the onions and garlic and let them sweat with a pinch of salt until the onions start to become browned. Add the thyme, rosemary, cinnamon, 1 bay leaf, chickpeas, tomatoes, and red wine. Cook until the liquid is reduced and the flavors mingle together nicely, about 20 minutes. Layer the potatoes on the bottom of a baking dish. Top with a layer of sauce, a layer of eggplant, another layer of sauce, another layer of potatoes, and finally a layer of beschamel sauce. Top with feta. Bake the dish for about 30 to 35 minutes until it’s nicely golden brown.